dataseed is a personal reflection of one's own place within the new global culture. Frequently woven into dataseed is g.'s own personal views and struggles with maintaining awareness of a reality in which all that we are told is true and good is determined by who can pay the most for our attention and beliefs. Musically this release can be described as an amalgamation of powerful beats, mind warping programming and intellectually driven lyrics. 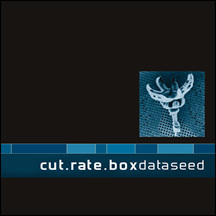 dataseed is a brilliant record from start to finish. This release also features a guest appearance from Victoria Lloyd (Claire Voyant and HMB) on the track "Enigma" and the North American version features new artwork that was conceived and designed by the members of cut.rate.box. Also this version features all new mixes from Stromkern and DJ Tony Estrada as well an alternate version of "Thin Ice" called "Thin Air" and the Assemblage23 remix of "Zionsank." This is truly a progression to another dimension.